Dr. Mary Jurrison explains how Mayo Clinic incorporates Tai Chi into physical medicine and rehabilitation, including cardiac rehabilitation. – Reduce the risk of falls and injury. -Improve blood pressure, circulation, heart rate, reduce stress and increase energy. -Prevent osteoporosis, ease pain, increase flexibility, balance, and structural posture. Some recent studies have also shown benefits in people suffering with Fibromyalgia. At the Tai Chi Association we teach Tai Chi as it was originally intended to be taught, both for health and as a martial art (what is known in the classics as the civil and the martial). 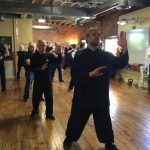 Tai Chi Master Michael Paler instructs classes weekly at our school, here’s an easy link to our Beginner’s Class Schedule.